Portrait of a house-killer: The eastern subterranean termite, Reticulitermes flavipes is commonly found in homes. Photo courtesy of USGS Bee Inventory and Monitoring Program/ by Sam Droege. Termites are often thought to infest only tropical or temperate areas. In fact, they thrive in most parts of southern Canada, especially along the coasts. They are commonly found in large cities like Toronto or Ottawa. 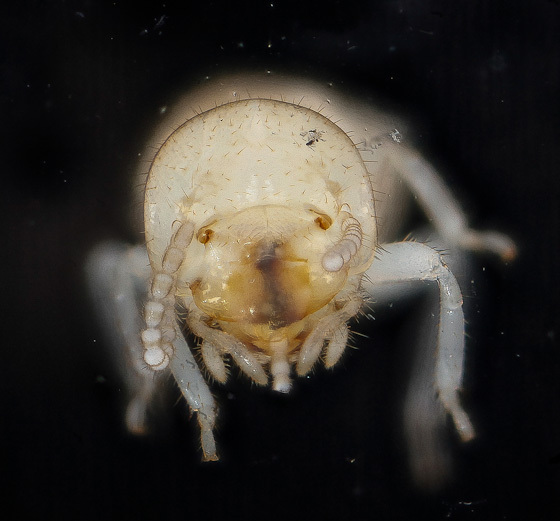 The most common type of termite to infest Canadian homes is the subterranean termite (in the East, Reticulitermes flavipes, in the West, Reticulitermes hesperus). A mobile problem: Subterranean termites about to swarm. Photo by Ben Friedson. Subterranean termites spend most of their lives underground, in colonies with up to 2 million members (depending on the species). 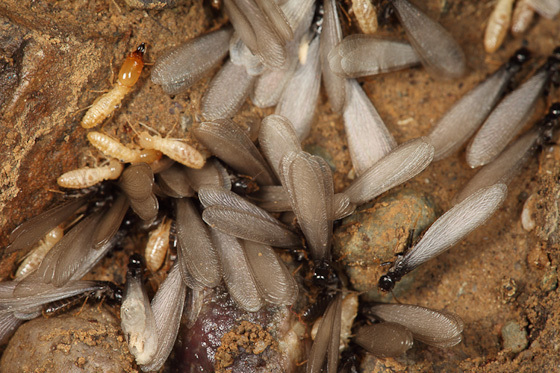 In the spring, subterranean termites swarm when groups of reproductive termites go off to start new colonies. They feed on the wood of a home or building, targeting wooden floors, furnishings, window frames, doors, wall paneling and much more. As termites rarely show themselves in the open, infestations can be difficult to detect until damage becomes severe. If subterranean termites spend too much time above the ground, their bodies begin to dry out and they die. To avoid this, termite workers make mud tubes along the surfaces of walls, fences, tree trunks or steps so they can work and eat in the comfort of moist ground. Termite mud tubes look as if someone has painted long thin lines on your home with dirt. Dry tubes are old tubes. Old tubes may indicate that the termites are still residing in your home. 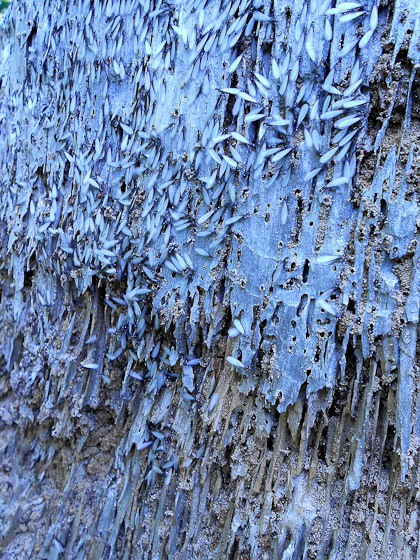 If you scrape open a moist mud tube, you may see the termites at work. The most common places to find subterranean termites in a home are basements, garages or any other room on the ground floor. All termites make tunnels through many types of substances like wood, mulch and drywall. Eventually, the internal structure of the material becomes so riddled with tunnels that it collapses. This is why it is so important to spot termites early, before severe damage occurs. Unfortunately, you need X-ray vision in order to see the tunnels. However, you can determine the presence of tunnels by knocking on walls, steps or anywhere you suspect termites might be. If you tap a surface and it sounds hollow, this may be an indication of termite tunnels. 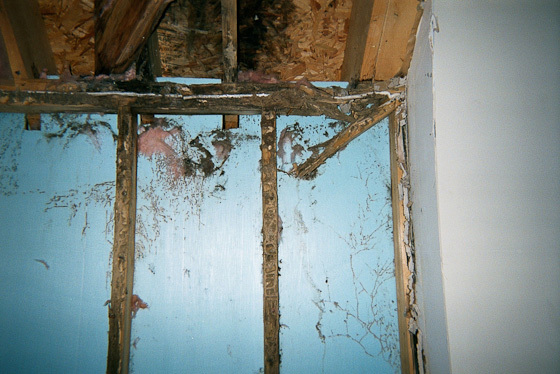 How bad it can get: Subterranean Termite damage in a structure. Photo courtesy of the Armed Forces Pest Management Board. Another sign of termite damage is when you see strange spots or stripes on the surface of wooden items throughout the home such as steps, walls, window frames, doorways and furniture. Inspect your home in search of wood surface that appear discolored, warped or bubbling. If you notice hollow spots on wood surfaces, the termites have eaten just about everything under a thin surface layer. Flakes of paint, wallpaper or plaster on the floor is a big indicator that hollow spots exist. Beware; termites can actually fall out of these spots, at times. As home owners, you can prevent termite infestations by stopping any sources of moisture that would attract termites. In addition, you must ensure that landscapes are kept clean and neatly trimmed. Be sure that no trees are coming in contact with building walls. Firewood must be stored away from a building and kept dry. Termite damage is a frustrating problem as it harms valuable property that must be repaired if it is neglected for too long. Contact an experience pest control company, immediately, if you suspect a termite infestation in your home. Author Bio: Ben Friedson is a junior at George Washington University in Washington, DC, pursuing a BSc in Biology with a concentration in Entomology. He recently spent a semester studying at the University of Alberta, where courses in ecology heightened his interest in pest management and conservation issues. Subterranean termites ready to swarm. Photo courtesy of Tom Murray. Hi! This post is very helpful for homeowners like me because you gave signs to help identify the presence of termites. Here in the Philippines, the tropical climate means pests are more visible through most of the year. We have to update our pest control now and then because it’s so costly to repair when they’re neglected. Thanks!